Temporomandibular disorder is the term used for the musculoskeletal disorders of the jaw system, which comprises the temporomandibular joints and its associated musculature. 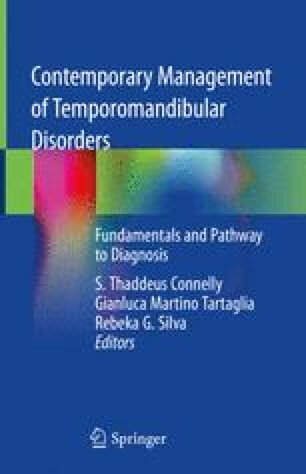 In the past decades, several concepts on the pathology, diagnosis, and management of temporomandibular disorders have been proposed, which have resulted in several classifications of these disorders. The most commonly used is the Diagnostic Criteria for Temporomandibular Disorders (DC/TMD) (Schiffman et al., J Oral Facial Pain Headache 28:6–27, 2014). In this classification, TMJ disorders are distinguished from masticatory muscle disorders, although these categories commonly coexist. Within the category of TMJ disorders, pain (arthralgia, arthritis) and disorders (internal derangements, including disc interferences, adhesions, ankylosis, hypermobility) usually represent manifestations of TMJ disease, which include arthritic diseases and growth disorders. This chapter focuses on the pathophysiologic processes occurring in the most common group of joint disorders, i.e., TMJ degenerative diseases (Stegenga, J Oral Rehabil 37:760–765, 2010).